Do you have a drawer that looks like this? The first time I heard the phrase “Nothing in Life is Free” was during my first visit to Best Friends Animal Sanctuary in 2009. I was listening to a Dogtown caregiver tell the story about their visit to Louisiana following Hurricane Katrina. Hundreds of dogs were being kept in temporary housing and rescue facilities and energy-burning activities were desperately needed to keep them happy and relaxed. So they grabbed a bunch of PVC pipe, drilled treat-size holes in short pieces and capped the ends. They filled the PVC toys with kibble and treats and kept countless dogs busy for hours, working to get their food. Genius. Today, I am all about food games and food-dispensing toys. But I freely admit that I am neither handy nor innovative, so I usually have to go to the store and purchase that kind of genius. I’m also a big fan of the hunt for your food game which can be played a variety of different ways, but my favorite is to chuck a gigantic bowl of kibble across the yard and watch my four furballs hunt for it while I quietly enjoy my glass of wine. Lazy, yes, but also effective and practical. 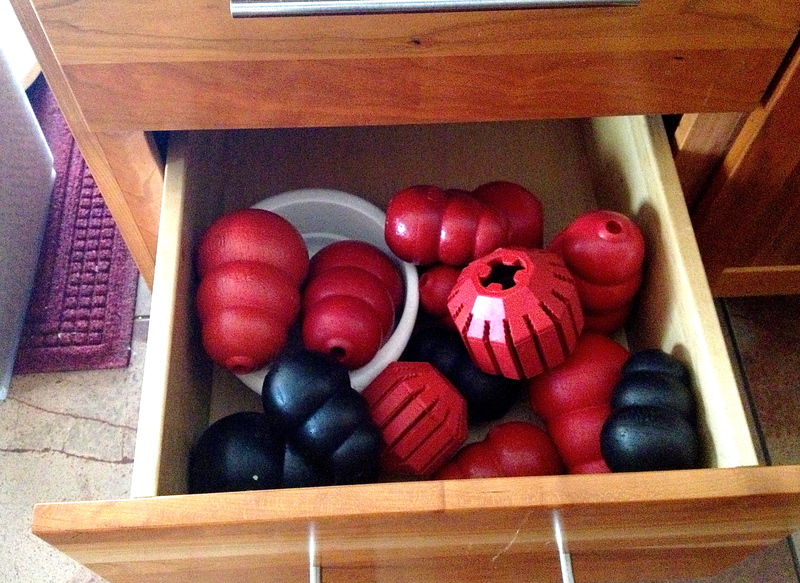 When it comes to food-dispensing toys though, I am still a devoted Kong fan. It is far and away the most durable line of food-oriented toys that I’ve found to date. There are several more options for puppies, but with adult dogs who have a knack for destruction, Kong rules. While the classic Kong is great for quiet time and for feeding full meals, particularly messy ones, the Kong Stuff-a-Ball is my favorite active food toy. The large size fits nearly an entire cup of dry kibble and is great for a quick activity for a restless dog. When the weather is good, I’ll take a full Stuff-a-Ball and chuck it all the way out to the other end of the yard for Buster to go find and busy himself with for a while. In the winter, I’ll stick a dog in the 3-season room with one and let them go to town. Similar to the Classic Kong, you can increase the level of difficulty and time spent retrieving the food by packing the toy more densely. For Peaches and Buster, who enjoy working hard for the food, I like to fill it full of kibble and then leave just a sliver of room on top for me to wedge a larger dog biscuit in that blocks the toy opening. This way the dogs have to squeeze and manipulate the toy enough to break the top treat and release the rest of the food. Watch the differences in approach in the following video. Peaches repeatedly picks the ball up and puts it back on the rug to maintain control over where the kibble gets scattered. Charlie is more accustomed to licking food out of a Classic Kong versus manipulating the toy with his paws or nose, so he needs a more loosely packed ball and some help getting it moving. Buster is all about active toy manipulation. You can see him actually squeeze the ball in his mouth to break up any larger treats blocking the opening. I’ve never had a single dog attempt to tear apart or destroy the Stuff-a-Ball and because they’re designed for dry food and treats rather than wet, you don’t need to clean them much either. The other nice thing about the Stuff-a-Ball and the other Kong dental chew toys is that they’re QUIET. 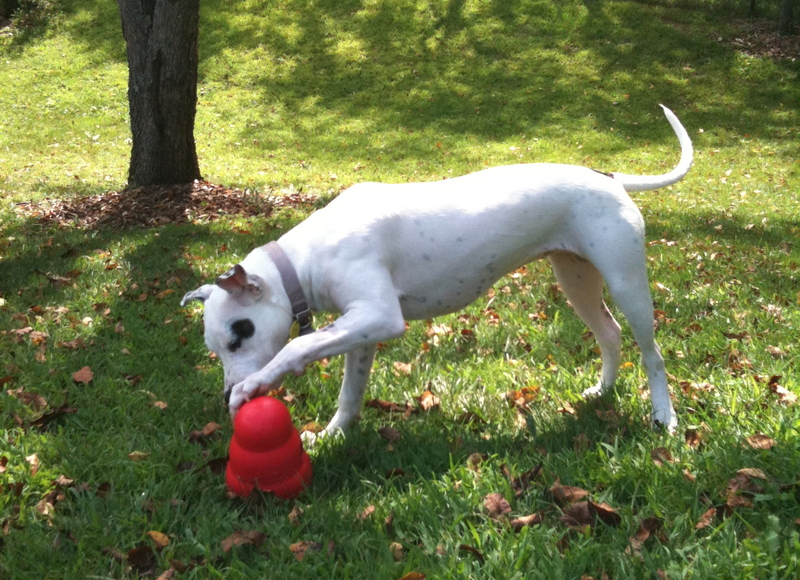 Below is a photo of our old foster dog, Blanca playing with a Kong Wobbler in the yard. She’s playing with it in the yard and not inside because it’s made of hard plastic and wow is it loud (although highly entertaining to watch). Great for homes with a few animals but likely to cause a ruckus in a kennel environment or with dogs who are easily stressed out by loud noise. One obvious caveat for using food games and food-dispensing toys is considering the dogs in your care and the environment you have to work with. We have four dogs in our home and we have no resource guarding issues of any kind. Our dogs do not fight over or compete for food in any context in our home or yard, so random food remnants left behind from food toys don’t cause any kind of problem–they’re just a fun surprise. With resource guarders and shared exercise or kennel areas, you’ll need to walk through the area afterwords to make sure nothing was left behind, which makes uncluttered spaces ideal areas for using the toy, although not necessarily crucial. And how about you? 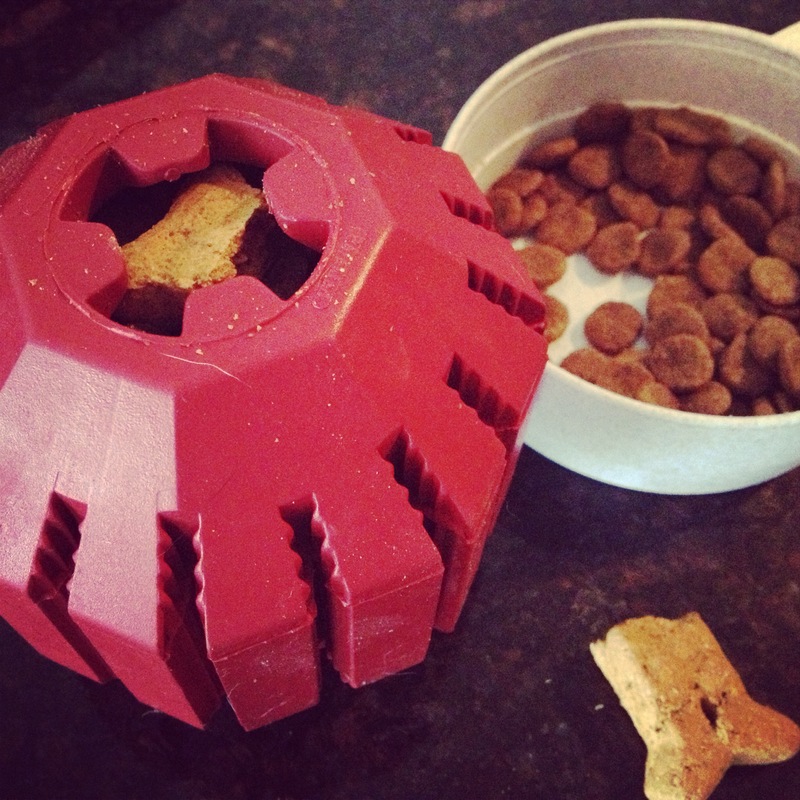 What are your favorite tricks and toys to keep your animals working hard for their food? And yes, I said “animals,” because as far as I know Kong toys work great for pretty much any animal capable of manipulating an object–cats, pigs, dolphins . . humans? Imagine if you had to bat and chase the vending machine around at work to get that Snickers bar out of it? This entry was posted in Animal behavior and training, Best Friends Animal Society, Dog play, Fun Stuff, Uncategorized, Videos and tagged animal care, animal shelter, animal welfare, Best Friends Animal Sanctuary, dog behavior, dog food, dog kennel, dog rescue, dog toys, dog training, dogs, Dogtown, food, Kong, Kong dog toys, Kong Stuff-a-Ball, Kong Wobbler, multi-dog homes, NILF. Bookmark the permalink. My dog hated the tug a jug as much as I did: hard plastic on hardwood floors is awful. I use a variety of toys (he’s not a power chewer, so they don’t have to be too sturdy), but I had to get rid of a really nice wooden puzzle toy because Kabota figured out that if he threw it across the room, all the kibble would pop out at once. I now have a nice gouge in my living room floor. I decided to use puzzle toys after watching Kabota drop a sealed container of tupperware on to the floor from increasing heights. Spoken commands remain something of a mystery to my dog, but his problem solving skills are top notch.